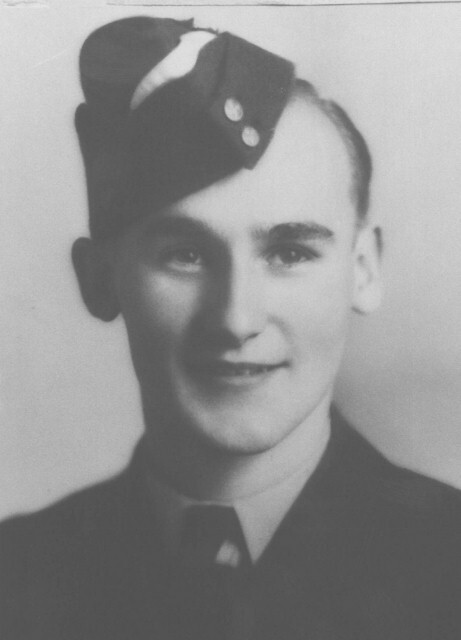 Harold Rumball gained an interest in military life at a young age and was a member of his high school Cadet Corps in his hometown of Summerland British Columbia. He loved cars and drawing, which he sometimes combined by drawing his own vision of cars of the future. And the people of his home town felt he would seek a career in engineering. With the war going into it's third year he like many in Summerland enlisted after completing high school. The chance to design future cars would have to wait. With two brothers already in the RCAF, there was no doubt about which service to enlist in. After enlistment he was stationed at Edmonton No. 4 ITS, Mount Hope, Camp Borden, Mont Joli Quebec at No.9 B&GS and Three Rivers. Posted overseas in 1944, after his arrival in April at No. 3 Reception Center the young Air Gunner was sent to Insworth then Dishforth where is slight build suited him for the tight fitting rear gunner position. The crew came together at Wellesbourne Montford, he then continued training at first in Wellingtons, then at the HCU on Halifax bombers. After he and his crew completed training at 61 Base they were attached to 419 Moose Squadron on October 16th, 1944 flying Lancasters. According to fellow crew mate James Eddy they had a pretty easy time of it even though they took part in 14 operations over some of the best defended targets in the German industrial belt. P/O Rumball's 15th. sortie was to the synthetic oil producing plant at Mereseburg. According to the only survivor, James Eddy, Lancaster KB769, VR-I was attacked from below. Ripping up the aircraft and setting it on fire. The pilot F/L George Tedford called for the crew to bail out. No one except Eddy made it out,as the aircraft went into violent spins which made it hard for anyone to escape. The six members of the crew were all lost. P/O Harold Rumball was originally buried in the village of Unterweissenbrunn and later moved to the Hanover War Cemetery. P/O Rumball was twenty-one.